Your diet has a enormous effect on your thyroid health and function. There are some foods that support thyroid health, while other foods may actually diminish thyroid function. Certainly it’s best to consume enough of the foods that support thyroid health. Just as you shouldn’t ignore the effect your diet has on your overall health, you shouldn’t ignore how nutrition can help, or harm, your thyroid. If you’re unsure of the condition of your thyroid, a knowledgeable healthcare practitioner can request blood tests to determine if your thyroid is healthy. 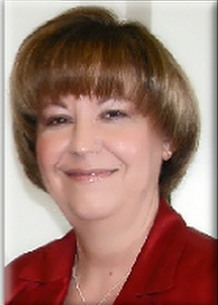 It’s a good idea for those who have known thyroid issues to get tested every five years, beginning at age thirty-five. Healthy thyroid function production happens when your thyroid is provided healthy nutrition. 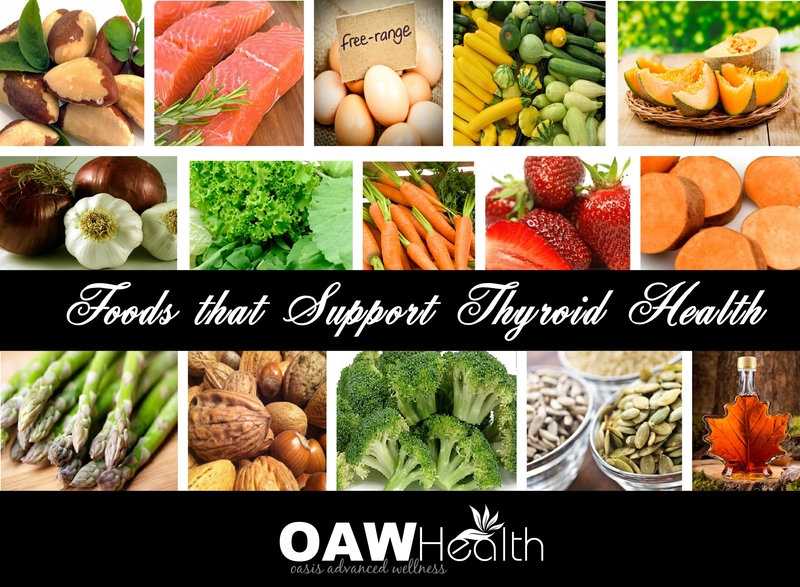 Iodine, iron, selenium, and zinc are all extremely important for thyroid health. Iodine deficiency is a frequent, contributing factor for hypothyroidism, and, as a world-wide concern, affects as many as two billion people. 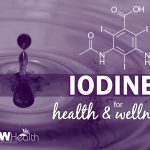 Iodine is an necessary component for thyroid hormone synthesis and becomes a part of the thyroid hormone itself. In fact, it’s impossible for the thyroid to produce hormones without sufficient iodine. A very healthy diet, especially one that includes foods that are a good source of iodine, should provide the minimum amount of iodine your body needs, which is 150 micrograms daily. If your diet doesn’t provide the amount of iodine your body needs, an iodine supplement can help your requirements. Your thyroid is also responsible for some very import functions in your body. Such things as controlling your metabolism, regulating your body weight and body temperature, and determining your energy levels. It even has an effect on fertility. I don’t know about you, but I desire to have steady energy all day long along with a metabolism that’s on my side. If you do too, then it’s extremely important to care for your thyroid by consuming foods that support thyroid health. Six Brazil nuts offer 774% of your daily selenium needs. Consuming just a few Brazil nuts on a daily basis provides more than enough selenium. Be aware that selenium toxicity is possible with higher doses. Whether you get selenium from food or supplements, it’s always best to stay within dietary guidelines. Brazil nuts also provide zinc, another important nutrient for your thyroid in which a deficiency could cause hypothyroidism. An underactive thyroid is usually due to inflammation of the thyroid gland. Salmon raises significant anti-inflammatory properties because its rich omega-3 fatty acid content. In fact, a study that looked at the effects of weight loss and seafood consumption concluded salmon to be the most effective at reducing inflammation, even better than cod, fish oil and a no-fish diet. The fatty acids found in fish may also signal thyroid cells in the liver to burn more fat, a recent study published in The Journal of Nutritional Biochemistry suggests. Make sure it’s wild salmon; farmed salmon is dangerous. Free-range or “pastured” eggs provide a concentrated source of thyroid-supporting building blocks such as protein, cholesterol, B vitamins, fat-soluble vitamins, and minerals. One egg contains about 20% of your daily recommended value of selenium and 15% of your daily recommended value of iodine. Egg yolks are also high in choline, which supports detox pathways and hormone health. Squash is high in antioxidants. According to the University of Mississippi Medical Center (UMMC) squash is good for the thyroid gland and may help with an underactive thyroid. Iodine is also found in summer squash. One cup of cantaloupe contains almost 5 percent of the recommended daily intake for magnesium. Magnesium is used in almost all functions of your body, including building muscles, regulating sleep, relaxing the nervous system, and the absorption of glucose. Magnesium is essential for the conversion of T4 into T3, which is essential for proper thyroid functioning. With regards to autoimmune conditions such as Hashimoto’s Thyroiditis (as well as Graves’ Disease), garlic can help to decrease proinflammatory cytokines and suppress nuclear factor kappa B, which are both factors in autoimmune conditions. As a member of the Allium family of vegetables, onions share some nutritional benefits with garlic and leeks, which are also members of this Allium family. Onions act as powerful antioxidants which stimulate immune responses and reduce inflammation in our bodies. Dandelion, mustard, and other dark leafy greens contain vitamin A. Vitamin A is required for activation of thyroid hormone receptors and insufficient vitamin A may depress thyroid function. Vitamin A is often deficient in people with any type of autoimmune disease, with Hashimoto’s being no exception. Vitamin A is an antioxidant and important for immune function. For the thyroid, vitamin A works together with zinc and vitamin E to convert T4 to T3 in appropriate amounts. A form of vitamin A are the carotenoids which are precursors to vitamin A. Carotenoids can be found in yellow and orange colored vegetables such as sweet potatoes and carrots, as well as other green vegetables. For better thyroid health, put antioxidant-rich food, like all manner of berries, into your diet. A study published in the Clinical Chemistry and Laboratory Medicine in 2008 found a link between antioxidant consumption and overall endocrine system health levels; higher levels of one correlated with higher levels of the other. Plus, antioxidant-rich foods are delicious. A 2008 study by researchers from Turkey suggests that people with hypothyroidism have higher levels of harmful free radicals than those without the condition. Berries are full of antioxidants, according to a 2010 study in Nutrition Journal. The researchers examined more than 3,000 foods and found that wild strawberries, blackberries, goji berries, and cranberries ranked especially high. Sweet potatoes are a rich source of fiber and contain a good mix of vitamins and minerals including iron, calcium, selenium, and they’re also a good source of most of the B vitamins as well as vitamin C. One of the key nutritional benefits of sweet potatoes is that they’re high in an antioxidant known as beta-carotene, which converts to vitamin A once consumed. Thyroid hormone plays a role in the conversion of beta-carotene to vitamin A. As a result, it is common for people with hypothyroidism and Hashimoto’s Thyroiditis to be deficient in vitamin A. There are phytochemicals in the skin and in the tips of asparagus that push back invaders, whether those invaders are chemical or viral. Asparagus also has an alkaloid that acts as a gentle aspirin throughout the body, calming down the body and lowering inflammation. In addition to the omega-3′s, walnuts are also rich in many antioxidants that help to prevent and repair brain damage due to free-radicals. Walnuts truly are an excellent food source to boost your mood, clear your mind, and help it to perform at its best. Moreover, the sufficient levels of selenium contained in walnuts may reduce your risk for swelling of the thyroid or goitre. It may come as a surprise to learn that ingesting radishes, cabbage, broccoli and kale can improve your thyroid function because they boost your glutathione levels. Glutathione is usually deficient in people with Graves’ Disease and Hashimoto’s Thyroiditis. Because glutathione is important for the immune system health, as well as the health of your liver and gut, it is important to correct this deficiency. While it is difficult to increase the intracellular levels by taking glutathione supplements orally, you can increase your levels by consuming foods that help to boost the production of glutathione, as well as taking certain precursors, such as alpha lipoic acid, selenium, and L-Glutamine. The herb milk thistle can also help to increase glutathione production. Pumpkin seeds are a good source of magnesium and zinc. Magnesium is required for iodine uptake by the thyroid tissue, which then stimulates the production of thyroid hormones. Zinc is critical for the synthesis of thyroid hormones, and deficiencies can lead to hypothyroidism. Pumpkin seeds are also a source of tyrosine, an amino acid the body uses to manufacture thyroid hormone. If you don’t get enough tyrosine in you diet, hypothyroidism can develop. Many believe that roasted pumpkin seeds are best for helping thyroid issues. Maple syrup is an excellent source of manganese and a good source of zinc. Antioxidants are substances that can neutralize free radicals and reduce oxidative damage, potentially lowering the risk of some diseases. Several studies have found that maple syrup is a decent source of antioxidants. In fact, one study found 24 different antioxidant substances in maple syrup. The darker syrups, such as Grade B, contain more of these beneficial antioxidants than the lighter syrups. As with all sugar-based sweeteners, if you’re going to consume even unrefined, natural sweeteners such as maple syrup, use only in small amounts. Carefully check the ingredient label to make sure pure maple syrup is the only ingredient. Many of the vegetables that are classified as goitrogens are also nutrient dense. Cruciferous vegetables such as broccoli, cabbage, and kale are known for their anti-cancer and antioxidant properties. Root vegetables such as sweet potatoes, turnips, and rutabaga provide a rich source of complex carbohydrate, which can be difficult to obtain on a grain-free diet. Cruciferous vegetables such as as sweet potatoes and strawberries contain carotenoids, which are precursors to vitamin A. Additionally, many of the fruits and vegetables on this list are a good source of the B vitamins, vitamin C, vitamin K, calcium, magnesium, potassium, zinc and sulfur. 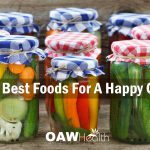 By avoiding these foods, you may be setting yourself up for future nutritional deficiencies. Most concerns about goitrogenic foods are related to a substance called methylthiobutyl glucosinolate that can be metabolized into progoitrin, a goiterogen that can decrease iodine uptake into the thyroid and reduce the synthesis of thyroid hormones. A comprehensive assessment published in Nutrition Reviews looked at the evidence and found that usual dietary intakes are far lower than those that could ever negatively affect your thyroid. This is especially true if you cook them (such as steaming, stir-frying, baking, etc. ), as it de-activates the goiterogen. We’ve established that a healthy thyroid diet is essential for healthy thyroid function. So if you need to boost an underactive thyroid or just want to be on top of your thyroid health, implementing the right foods is key to helping manage thyroid issues such as poor sleep and weight gain. Although the foods mentioned above are some general guidelines, keep in mind that everyone is different. 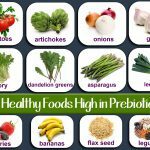 As a result, there might be some people who are unable to eat these foods due to food sensitivities, a yeast or bacterial overgrowth, etc. In a perfect world, most people should be able to get all the vitamins and minerals they need from diet alone. However, if you are not consuming a healthy diet or one that doesn’t provide a full spectrum of the nutrients your thyroid requires, iodine supplementation may be the answer. 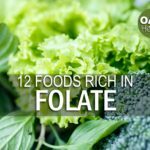 If you’re one of these people, I recommend Detoxadine Nascent Iodine, Selenium and Unique B-12. All three are specially formulated to nourish and maintain a healthy thyroid. Olivieri, Oliviero, et al. “Selenium, Zinc, and Thyroid Hormones in Healthy Subjects.” Biological Trace Element Research 51.1 (1996): 31–41. Web. Felker P, Bunch R, Leung AM. Concentrations of thiocyanate and goitrin in human plasma, their precursor concentrations in brassica vegetables, and associated potential risk for hypothyroidism. Nutr Rev. 2016 Apr;74(4):248-58.